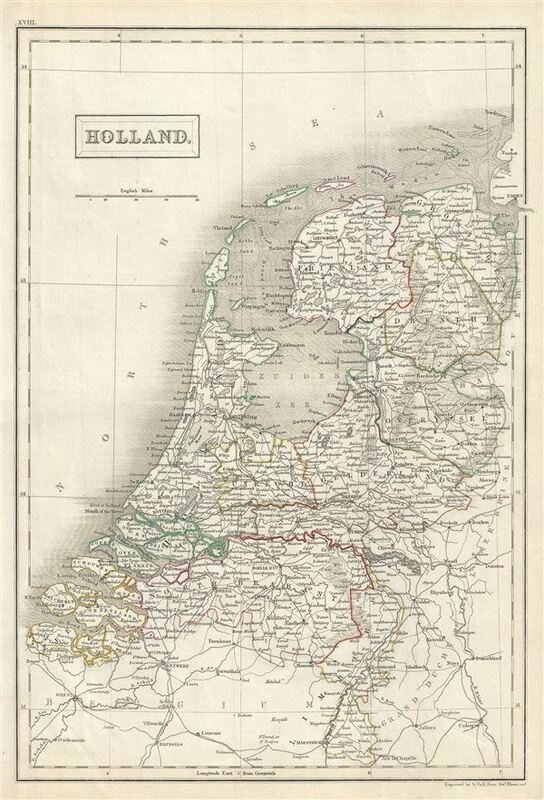 This is a fine example of Adam and Charles Black's 1844 map of Holland or the Netherlands. The map covers the Kingdom of Netherlands, commonly referred to as Holland, from the North Sea to Belgium and the Grand Duchy of the Lower Rhine. Throughout, the map identifies various cities, towns, rivers, lakes, swamps (including the Peel) roadways, railways and an assortment of additional topographical details. In 1830, the Belgian Revolution led to the secession of Belgium from the United Kingdom of Netherlands into the independent Kingdom of Belgium. This map was engraved by Sidney Hall and issued as plate no. XVIII for the 1844 edition of Black's General Atlas.